A revised and updated edition of the World's most widely used medical reference, The Merck Manual of Medical Information, Second Home Edition. For more than 100 years doctors have been coming to us for advice. Now you can, too. The Merck Manual has traditionally provided exclusive, up-to-the-minute information to doctors, nurses, and other healthcare professionals. Now, with the special Home Edition, the general public can access virtually the same critical data contained in the physician's version—but in everyday language and a reader-friendly format. ...and much more. Featuring original illustrations and diagrams, an A-Z listing of brand-name and generic drugs, and an appendix of medical resources, The Merck Manual Home Edition is published as a not-for-profit service by Merck, a world leader in breakthrough medical discoveries with a long commitment to making the world a healthier place. Sherwin Noland, M.D. Clinical Professor of Surgery, Yale School of Medicine; author of "How We Die, Doctors, and The Wisdom of the Body"Merck has accomplished what I had thought was impossible -- to produce a clear, readable explanation of the normal and diseased functions of the human body....This is a remarkable contribution....Doctors should encourage their patients to own it. Jane E. Brody "The New York Times" The most useful [medical guide] of all...consumer friendly...clever cross-referencing...includes topics missing from many competitors. Just received the book today. Not what I was expecting! Want to know why the book has almost 2000 pages? Because it's small. The dimensions are 7" L x 4" W x 2 1/2 " T. And what happens when you decrease the page size? The letters get smaller. I tried to find the chapter on "eye strain" but the words were too small for me to read! It's ironic that a book published to assist people with health information may actually cause medical problems! I'm sure the health information is sound and accurate. The edition I purchased was copyrighted in 2003. The covers are thin, though and the binding seems weak. I can deal with handling the book gently, but I wish the format was larger. ****UPDATE*** Although I initially and hastily reviewed this manual at 3 stars I have since had time to read it's contents. My critique was for the small format and not the subject matter which I found informative and fascinating. I rescind my previous rating and increase it to 4 stars for it's detailed , but not technical explanations. Also I found useful the chapters on child and adolescent development. 3.0 颗星，最多 5 颗星Bigger is better. Information aplenty, format lacking, before you buy please note the size of this publication, a mere 4X7 inches and 3 inches thick. This book is difficult to manage and should be offered in a full size hardcover for those of us less nimble with the mighty page. 5.0 颗星，最多 5 颗星1500 pages of information, not watered down! This reference book is easy to use and understand. When I first leaned of this home edition version of the Merck manual I was hesitant. Over the years many books have been published that are medical in nature, some published by doctors, but the content is watered down or so vague that a layperson doesn't derive much information from it. Some books are actually condescending in attitude, some patronizing. So many books briefly skim symptoms and then caution to call a physician for more information. Recently my son was diagnosed on the phone by our pediatrician with chicken pox and it was made clear that they did not want to see him for a physical exam. I was given a tiny bit of information by the office staff but was still curious for more information. I spent over an hour surfing the Internet looking for information but found watered down information, repeated many times over on multiple websites, including some written by physicians intended for laypeople to use. I looked at my parenting books written by doctors (one titled "The Portable Pediatrician", no less) and was still lacking any substantial information. When I consulted the Merck Manual home edition, (which I had forgotten I bought recently and had not yet used), I was surprised at the level of information given. There are many details that I had not found elsewhere, such as number of days from exposure to outbreak, how long it takes the pox to change from first appearance to crusted over, about how long the infection lasts, and treatment suggestions. Reasons why some children have a mild outbreak vs. a severe outbreak were even provided, something I had not found anywhere else. The information here is not dumbed down in that it is not so vague that it is not useful. There is a lot of information here but it is written in a style for the layperson to understand. I appreciated the writing style, which presents information to the non-physician without putting on airs. Anyone who, like me, prefers to gather information and learn about things rather than making a call or office visit to their doctor to get just one opinion will appreciate owning this book. At about 1500 pages it covers many illnesses and ailments. If you are interested in this book I suggest you buy it so that you have it at your fingertips 24 hours a day, for whatever may arise. I am not suggesting this take the place of a doctor, but I know from working with physicians that there are certain calls that are non-emergent in nature that are not appreciated when the office is closed! If you are looking for a book about children's ailments that encompasses not only western medicine but lists an array of other treatment methods, I suggest Smart Medicine for a Healthier Child: A Practical A-To-Z Reference to Natural and Conventional Treatments for Infants and Children by Janet Zand. I found this to be an excellent companion to the Merck manual, home edition. The Merck manual gives more information about the disease or ailment itself through a Western medicine viewpoint while the Zand's books' specialty is sharing treatment options grouped by category (herbal, homeopathic, western, etc.). I retired from this organization a while back. Being a Pharmacist, I always admired "Merck" and even more so after I worked for them. The Home Edition is more easily understood by non-medical folks than the straight up "Merck Manual" (my opinion). Same info pretty much but in lay folks terms. Lots of great info on a plethora of topics. A must have for folks that do survival type activities. The Merck Manual of Medical Information is a well organized and well-written book that clearly explains medical conditions. The book is organized by chapters covering the major organ systems and their medical problems. You will also find a chapter discussing medications. 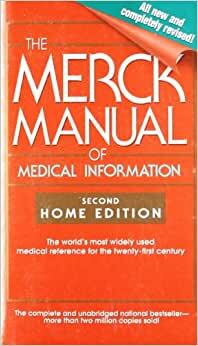 If you are looking for a book that will help you understand medical conditions, you will find The Merck Manual of Medical Information a terrific addition to your home library.